There are many things that are misunderstood in the golf swing, but lower body function and ground machines are where most players could benefit from a better understanding. 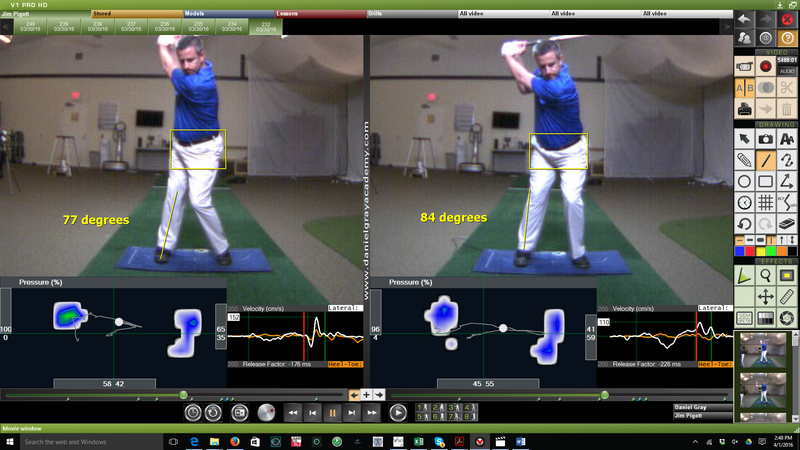 Lower body ground mechanics are ever present in tour swings and competitive amateurs, but when we get to mid to even lower handicap players they seem to think that a “quiet lower body” will help them become more accurate or consistent. Here in lies he misunderstanding and thus the loss of control and distance. Let’s take a further look into lower body mechanics and also how we use the ground. 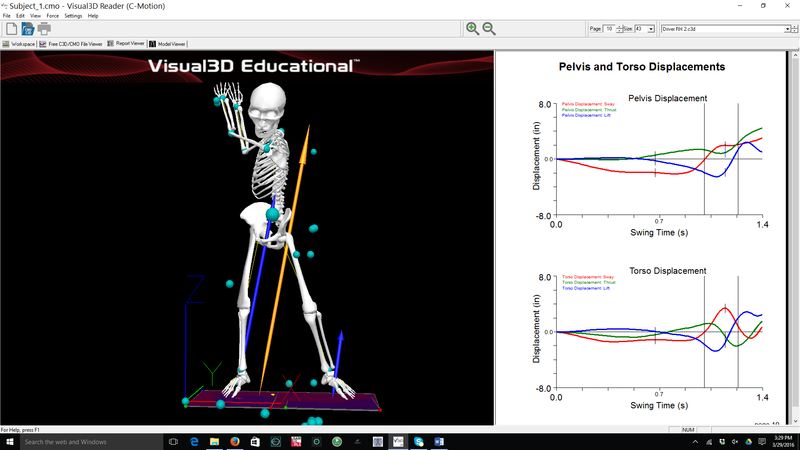 This is a still image of Penn State University’s 3D Biomechanical software that depict what is actually happening with the lower body during the backswing. The chart on the right, I would not expect you to decipher, but if you will take a quick look at the graph on the top right of the page, Pelvic Displacement. Now take a specific look at the red line that runs down at first and then back up just before the first large vertical line in the graph, which is your transition into the downswing. This line, when it goes down (Negative) is your pelvic swaying away from the target in the backswing and when it turns positive just before the transition of the downswing the pelvic is starting to move forward towards the target. The image of the left of the skeleton, when played in motion, you can see a slight shift in the pelvic during the backswing. These are things that can get missed on video due to the nature in size of the motion, but none the less it is happening. The way ground mechanics work is simple, you have to push before you can pull, squat before you jump, and yes sway right, correctly, before you can shift or sway left. Now just like anything this can be taken out of context and over developed, but as long as you are also rotating your pelvic in the backswing in addition to swaying slightly you can significantly improve clubhead speed and also help contact by delaying the low point of their swing. Here is an example of a player who thought that keeping his hips from “sliding” or “swaying” in the backswing would improve his consistency of strike. The images on the left are from before and the images on the right are during a drill that he was completing. The center of pressure traces on the bottom of the screen are from Boditrak and they show the later shifting of the center of pressure. The center of pressure is one of the more efficient ways to understand how your lower body mechanics are working. Notice his center of pressure has increase from 61 to 94 percent in his trail foot in the mid-backswing. The 94 is a little high, but an improvement due to the pelvic sway he has added. Notice how his hips are just outside the box from address. This is a pretty efficient load of the trail foot and pelvic sway. Due to the unweighting of the lead foot he is now able to shift his pelvic first in the transition. This also has the added benefit of allowing a player to tilt hips pelvic flatter through impact which could allow the hips to rotate earlier. He is now leading in with his pelvic, then his torso, then his arms, and then his clubhead. This is a much improved sequence of events to start the downswing to create speed. The use of the lower body ground mechanics has allowed him to maintain some wrist set in the early downswing, which could help him create a low point after the ball due to more shaft lean at impact. This is another great product, SwingGuru, which measures your COM, center of mass, which is located very close to the pelvic in most people. Notice that the COM, in the bottom right chart, is shifting away from the target during the mid-backswing. This is another sign that the pelvic should shift away from the target during the backswing. 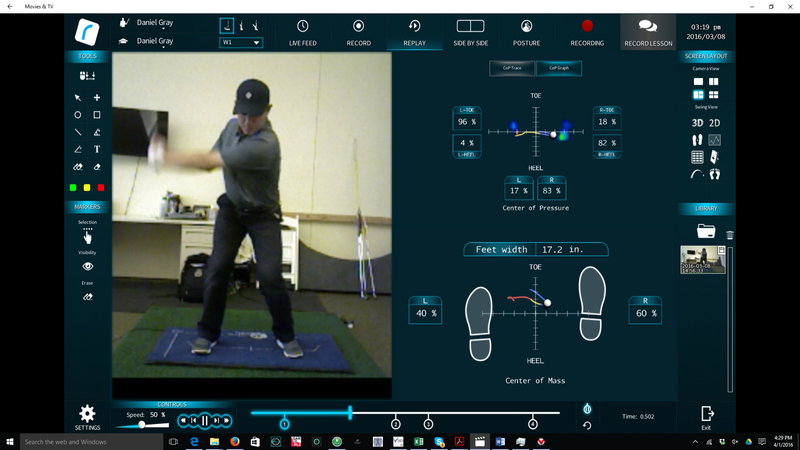 You can also notice in the top right hand chart that the BodiTrak pressure shift is shifted back further than the COM, another indicator that the momentum of the hip sway has created additional pressure in the trail foot in the backswing. 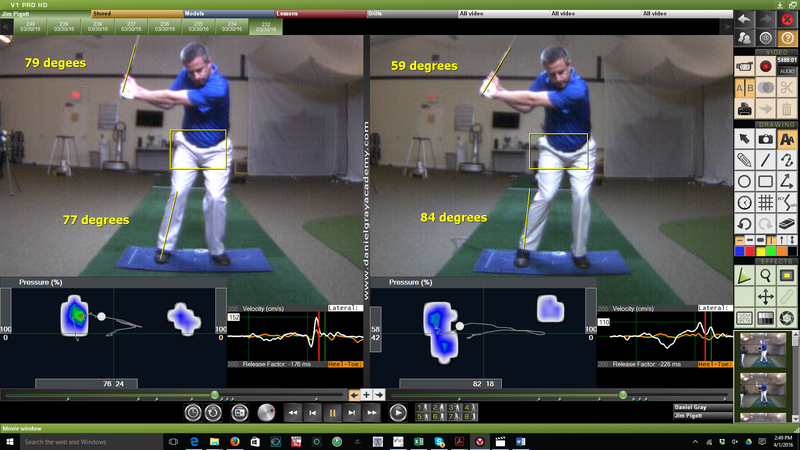 The summary is this, allow you hips to sway and rotate in the backswing to have improved lower body and ground mechanics. This is a safer way to swing and it creates more speed and should feel more dynamic and athletic to most players if done correctly.